The purpose of this lab was to put copper and other compounds through multiple experiments and try to come up with the same amount of copper you started with after the last reaction. We concluded that through all of the reactions that occurred you should still be able to receive the same amount of copper you started with if performed perfectly. In our experiment however, we ended up with more copper than we started with which is due to some errors that occurred during the experiment. This lab focused on the law of conservation of mass. This states that mass cannot be created nor destroyed. When a reaction occurs between different elements and compounds, the mass of the products should equal that of the mass of the reactants. We tested this law with our copper lab. We put copper through five different reactions. The amount of copper that we started with was 2.006 grams. In theory, after all five reactions have occurred and copper is back to its original state we should come up with the same amount. We however, did not get this number exactly. All of our reactions were balanced correctly which provides that we used the correct amount of each compound in the reaction and came up with the amounts that we should have. It also ensures that we use up all of the reactants in the reaction and nothing is left unreacted. Even after all of the reactions occurred we still should have the same amount. We ended up with almost twice as much copper as we started with. Based on the law this should not be possible. After looking back on our reaction we can concur that our final compound was not solely copper. In the last reaction copper sulfate was mixed with zinc to in the end leave copper by itself. If all of the zinc did not react with the copper sulfate, then some sulfate particles could still be bonded to the copper. In theory all of the copper still existed in the final set of products but it may not have been solely copper. 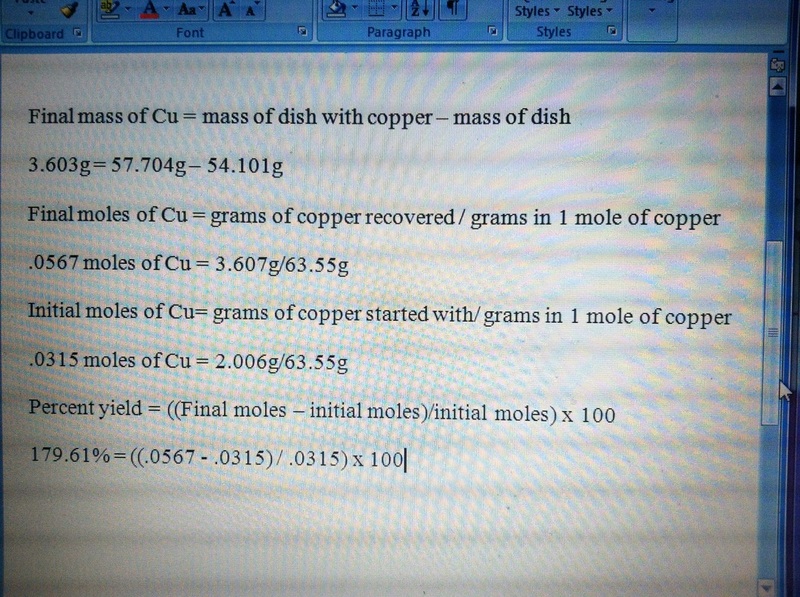 Even though our numbers suggest that copper was created it was not. The law of conservation of mass was in effect and that was the key point to be understood from this lab. This lab included many sources of error. Our group obtained 1.597g more copper than we started with for multiple reasons. One is that measurements and instruments could have been misread or not calibrated correctly. Another is that when going from reaction to reaction some of the copper may have gotten stuck to some of the equipment or poured out when the solutions were decanted. This would only account for a small difference but will still lead to incorrect amounts. A major cause for error may have come from addition of other compounds and elements to the copper. Not all of the zinc in the last reaction may have reacted and evaporated off. Some water may also still have been left in the copper because there was not enough time to allow all water to completely evaporate. 1. The reaction between copper and nitric acid was put on ice to reduce the amount of heat given off. The reaction may have been too hot and need to be kept cool by the ice. 2. The reactions that occurred in steps 4,7 and 9 were double replacement, double replacement and single replacement respectively. 3. 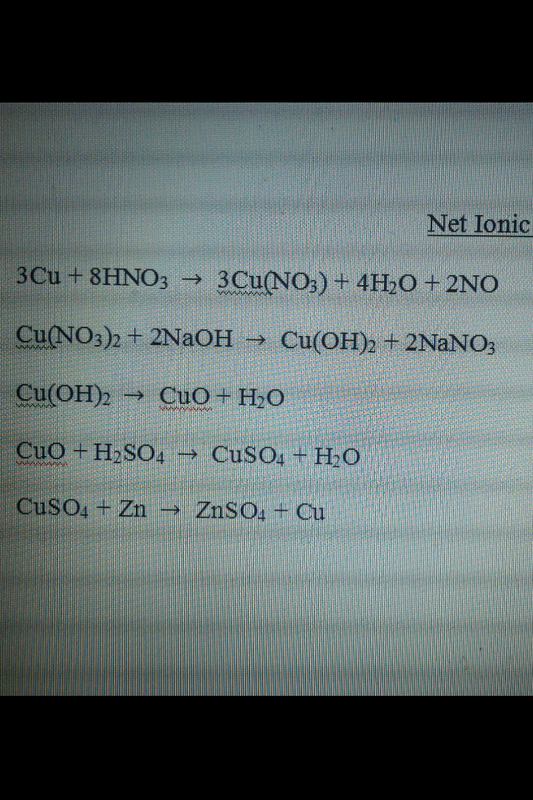 CuSO4 + Zn => ZnSO4 + Cu. This step can make it seem like there is more copper than there actually is because if there is an incomplete reaction some sulfate will still be bonded to the copper. 4. When the CuO was washed, sodium and nitrate ions were removed. 5. The form of copper that was present in the beaker after sulfuric acid was added was solid copper sulfate.